The trimaran MACIF, which came out of CDK Technologies’ workshops in 2015, is continuing to take the yachting world by storm thanks to the seemingly unreal performance of her skipper François GABART, which has earned him the new Solo Round the World Record under sail (Alain Colas Trophy) with a time of 42d 16h 40m 35s, improving on the previous record set by Thomas Coville in late 2016 by 6 days and 10 hours. A stellar achievement, especially when you consider that Thomas’ record had itself shaved nearly 8 days off the previous time and that this latest record set by François is just over one day shy of the outright Jules Verne Trophy record, secured in the hands of a crew of 5 in 2016. Having begun their journey together in the IMOCA class (construction of the monohull MACIF in 2010), the collaboration between CDK Technologies and Team MACIF has continued to go from strength to strength. This shared history is all the more significant as it is has shaped the evolution of CDK Technologies which, thanks to Team MACIF, was the first yard to build a latest generation Ultim trimaran, namely a maxi multihull geared towards singlehanded sailing. Each of these programmes has resulted in joint success for CDK Technologies and Team MACIF from the moment these boats were launched, illustrating the extraordinary quality of the collaboration. Victory for the Trimaran MACIF in the Transat Jacques Vabre 2015, followed by wins in The Transat Bakerly, the Armen Race and The Bridge, prior to this latest conquest of the Solo Round the World Record at the very first attempt. 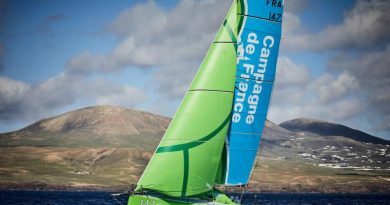 In late 2013, 20 months prior to the start of the Transat Jacques Vabre 2015: the Collectif Ultim was created at the instigation of 3 major sponsors in the sailing domain: MACIF, BANQUE POPULAIRE and SODEBO, which established a set of rules enabling fast maxi-multihulls to be designed for sailing singlehanded. François Gabart is a passionate defender of this Collective, pressing his entourage to share his vision that this is a sphere into which singlehanded offshore racing must be propelled. In 2007, having built the 40-metre Maxi Trimaran Banque Populaire V, now known as Spindrift, followed by the series of 7 MOD70 trimarans from 2011 to 2013, CDK Technologies is a reference in the domain of Maxi-multihull construction. After an intense period of quotes and negotiations, MACIF decides to entrust the construction of its new Ultim trimaran to CDK Technologies. Proof of their confidence in the yard, it’s a sizeable challenge for CDK Technologies, which was also working at the time on the construction of 2 IMOCA monohulls, fleshed out a few months later by an order for a mast for the Maxi-trimaran Spindrift 2. In late 2013, the major work begins: In conjunction with the start of mould construction at CDK, the team literally pushes back the walls of the oven to enable the 30-metre-long floats to fit inside. The collaboration between Team MACIF and the CDK Technologies’ design office is constant. François radiates his approach to performance to his team and more broadly the teams within CDK Technologies. The march towards success has begun. The workforce at CDK Technologies expands from 45 to 85 people in 6 months and it’s a mighty challenge to jointly pull off this mission. It’s an intense period on every level. As a result, the Trimaran MACIF begins to take shape in the shelter of the yard’s big sheds, in the run-up to the assembly of the various parts being built in nearby Lorient. December 2014: the central hull is delivered to Keroman Technologies, the assembly subsidiary of CDK Technologies: Recognised for its expertise and its exceptional location in the naval repair yard in Lorient, Keroman Technologies was created in 2007, and specialises in the assembly of Maxi-multihulls. 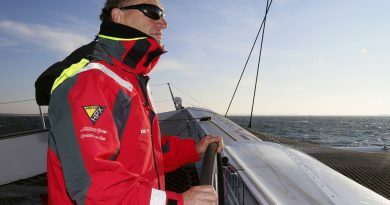 Team MACIF has set up its base in Lorient and the quality of relations between the yard’s teams is constant. François passes on ‘his positive vibes’ to all the staff involved in the project. Spring 2015, the launch date is dawning and a series of finishing-off phases ensues at Keroman Technologies, the trimaran gradually being clad in the livery of her sponsor, and we discover the first imposing foils of a trimaran that we can already guess François intends to fly with. Already creating a stir among enthusiasts is the famous ‘cabin’, an ergonomic innovation designed to enable an emergency intervention at speed in the event of a navigation incident whilst the skipper is sleeping. August 2015, the launch and static tests: After a 20-month build and 100,000 man-hours, we finally discover the big bird in the colours of MACIF. From the finesse of her lines and her wave-piercing bows, to the cockpit and the cuddy, which close off the cabin, this latest generation trimaran fuels many a conversation. Is it reasonable to participate in the Transat Jacques Vabre in early November with so little preparation on such an innovative trimaran? The following week, the first challenge for the builder and the naval architects: the static tests dockside. Long stressful days ensue, punctuated by nightmarish sounds as the carbon takes the weight of the huge loads outlined by the design office: however confident you are of the build quality demonstrated by the teams at CDK Technologies, you always breathe a little easier once the seemingly endless list of boxes are ticked. Deliverance after the initial sea trials: you really get the sense that the lucky few participating in the first sail will be riding high for a long time to come after witnessing the first flight. The speeds posted immediately make an impression and François is already starting to tame his machine. He expresses his gratitude to his team and to CDK’s workforce, who participated in the build. November 2015: victory in the Transat Jacques Vabre! François continues his winning streak in all the major events, successfully taking the win in The Transat Bakerly in 2016. December 2016: Thomas Coville smashes the solo world record under sail! After several attempts, Thomas Coville slices more than 8 days off the record previously held by Francis Joyon, bringing the time to beat down to an incredible 49 days and 3 hours. Clearly it raises some doubts among sailing specialists as to how feasible it is for future pretenders to victory to better such a benchmark. François readies himself for the challenge, tirelessly continuing to develop his boat to adapt and fine-tune her so it is easier to make the best of her potential. December 2018: the solo round the world record attempt is on! After a brief period of stand-by, François snaps up the first weather window to set sail on his bid to secure the record, despite his routers telling him that it’s an interesting window, but the winter could herald true optimum conditions. The descent of the Atlantic, the start of the Southern Ocean and some incredible passage times! Every day reveals an almost perfect trajectory sailed by the Trimaran MACIF. Checking the day’s log becomes a daily ritual at CDK. Comments fly about the incredible speeds, the teams track the evolution of the singlehanded 24hr record, wondering how long François can keep up such a pace, and above all how the machine is doing. The teams live in fear of the phone call announcing a mechanical glitch, that may slow progress in such a demonstration of strength. The social networks are crackling and François still manages to find the time to send videos and messages and their breathtaking sincerity. At the same time, he continues to lavish an optimism on those back on land that makes every one of CDK’s associates proud of the work accomplished on the Trimaran MACIF. Record after record: every remarkable passage point (Cape of Good Hope, Cape Leeuwin, Cape Horn…), is punctuated by a record, some of which even better the best passage time in crewed configuration. Indeed, during his climb back up the Atlantic, François is even keeping on the pace of Francis Joyon’s crewed record, despite it seeming unattainable at the time! The regular news from the Team about the condition of the boat is fairly reassuring, but everyone knows that François has to be maintaining a radio silence on the little knocks and setbacks that the machine is having to endure. Now though, the lead over the previous solo record is such that, barring major mechanical issues, the record will be smashed out of the water. Sunday 17 December, deliverance! The Trimaran MACIF crosses the finish line, shaving nearly 7 days off the previous record, in what is an unreal performance. The members of CDK’s staff and a few associates who participated in the construction of the Trimaran go out on the water to welcome her into Brest harbour after she crosses the line. All around are happy faces. It’s time for the debriefing and the stories that will be repeated a hundred times or more. A fantastic reward for the team at CDK technologies, the news of which is spreading like wildfire at the yard. This achievement once again shines a spotlight on the excellence of CDK Technologies and its associates.